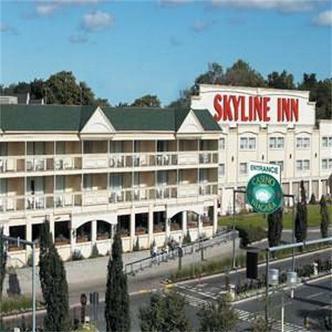 The hotel is now 100% smoke freeThe newly upgraded Skyline Inn is ideally located one block from the Falls directly connected to the Fallsview Indoor Waterpark via an indoor skywalk. In the heart of the Falls Avenue Entertainment Complex at the front steps of Casino Niagara The Skyline is perfectly located to experience all Niagara Falls has to offer. The Fallsview Indoor Waterpark is the newest attraction to Falls Avenue featuring 125000 square feet of family fun. The eight story high park includes.. sixteen thrilling slides.. adult Jacuzzis.. wave pool.. outdoor sundeck and pool.. the Beach House Mammoth Aqua Play area.. Tiny Tots Splash Park.. Food Court.. Arcade and more.Self parking is available at the hotel for $6.00 CND per day plus tax.